Despite Thursday’s European Central Bank (ECB) news being perceived as generally optimistic, the Euro to Pound Sterling (EUR/GBP) exchange rate saw relatively flat trade and remained steady on Friday morning. Since opening this week at the level of 0.8945, EUR/GBP has slipped and spent most of the week trending nearer the level of 0.8915. On Wednesday, EUR/GBP briefly touched a monthly low of 0.8890. The primary reason for the Pound’s (GBP) strength this week has been speculation that the UK and EU were more eager to make sure that some kind of Brexit deal is reached than allow negotiations to collapse. As a result of hopes for Brexit talks, the Pound remained fairly resilient against the Euro throughout the week – even after the European Central Bank was more optimistic about the Eurozone economy than some investors expected. 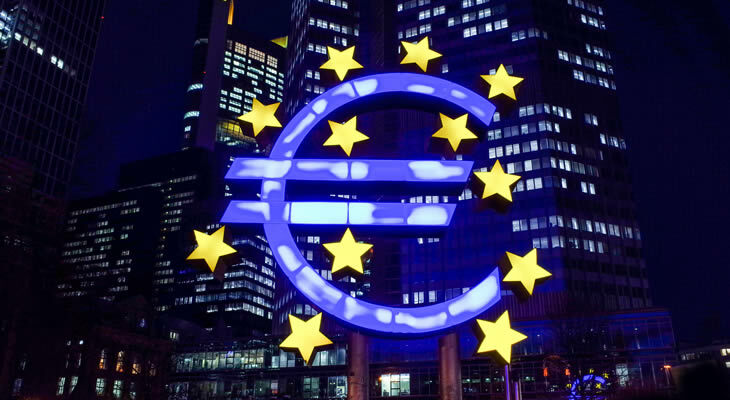 The European Central Bank (ECB) cut its growth forecasts on Thursday, but the Euro still strengthened slightly following the bank’s September policy decision due to other news from the bank. As was widely expected, the ECB left Eurozone monetary policy frozen and reaffirmed its plans to withdraw its aggressive quantitative easing (QE) programme by the end of the year. The bank will begin to half its bond purchases in October and QE will fully wind down by the end of December. On top of this, the bank also confirmed that despite fears about US-EU trade tensions and concerns about how US protectionism could impact growth, its inflation outlook remained unchanged. The bank still expects to Eurozone inflation to steady near 1.7% in the coming years. Lastly, concerns of Eurozone banks being negatively impacted by major selloffs in emerging market currencies lightened considerably, as ECB President Mario Draghi said the spill-over had not been substantial. Friday’s Eurozone data was mixed, but news that Eurozone labour costs and wage growth had riven in Q2 did offer the shared currency some more support and help EUR/GBP avoid its weekly lows. Despite the fairly optimistic European Central Bank (ECB) news on Thursday, the Pound was able to avoid notable losses thanks to persistent hopes that UK-EU Brexit negotiations were improving. At the beginning of the week, EU Chief Negotiator Michel Barnier showed confidence that reaching a UK-EU Brexit deal within the next eight weeks was ‘realistic’. With both UK and EU negotiations showing eagerness to avoid a worst-case scenario ‘no-deal Brexit’, investors are becoming more confident that a deal will be made. This has given the Pound much stronger support this week and has prevented it from falling, despite warnings from the Bank of England (BoE) on Thursday. The Bank of England left UK monetary policy frozen as expected and noted that Brexit uncertainties were having a negative impact on UK business confidence and activity. However, the bank also said its concerns about US trade protectionism had risen since August, and BoE Governor Mark Carney said on Thursday night that a ‘no-deal Brexit’ could be as bad for Britain’s economy as the 2008 financial crash. Investors largely overlooked these warnings for now though, as confidence remained that a UK-EU Brexit deal was more likely to be met than talks were to collapse. While Brexit developments are likely to remain highly influential to the Pound, the Euro to Pound (EUR/GBP) exchange rate outlook could be influenced by key August inflation rate figures throughout the next week. The Eurozone’s final August Consumer Price Index (CPI) inflation rate will be published on Monday. Inflation is projected to have slipped slightly in August, so if it comes in even lower EUR/GBP could weaken. Weaker Eurozone inflation would make investors concerned that inflation will not steady in the coming years as the European Central Bank (ECB) predicts, which would weigh on ECB interest rate hike bets too. Wednesday will see the publication of Britain’s August inflation rate data, which could influence Bank of England (BoE) interest rate hike bets slightly. However, Brexit uncertainties and developments are likely to remain the dominant force in Bank of England bets and Pound movement. Later next week, UK retail sales stats from August and Eurozone PMI projections for September could also influence the Euro to Pound (EUR/GBP) exchange rate outlook.